You must be a member of the Milan Romanian Tips & Tricks Group to attend this activity. Would you like to join this group? Where could it be better to organize a funny evening together with friends from all over the world, if not at theProtected content where multiculturalism is at home? 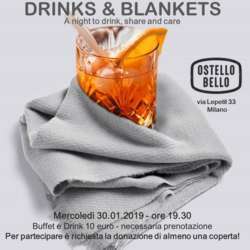 But we want to give a better taste to this aperitif, gathering blankets and warm clothes for all those who are living into the streets all nights. So, empty your wardrobe, find some scarfs, hats, gloves you’re not using anymore, buy a blanket or a sleeping bag and join us. We are waiting you at Protected content Wednesday January 30th at 7.30 p.m. NOTE: For participating at the event, bringing a “warm gift” for the homeless (blankets, warm clothes, sleeping bags, scarfs, hats, gloves) it’s mandatory ! For those who’ll bring at least 3 different gifts, we’ll be glad to offer a cocktail. Being an event with a closed number, for reservations you are invited to send an e-mail at: Protected content until Sunday evening January 27th, Protected content your name and surname and the number of participants.